Everything you need for a long or short term stay, allowing you to be self catering if you don't fancy eating out. Would definitely recommend this to anyone looking for a luxury style apartment! The staff were lovely and helpful too. The rooms have rainfall showers, nice city views and it is so close to the city! Just a 5 minute walk to everything you need! I love it!! Also it was a nice surprise to find a sky box in the room! Lovely apartment in probably one of the best locations to be for Central Manchester. Good location, was central but far enough out we didn't hear any of the city disruption. Very clean room with everything you need for a short or long stay. The property was neat and tidy and the staff were friendly and nice. The location was perfect. We loved the service they provided, facilities and how professional the place are. Family and friendly here. Everything is so local and easy access. 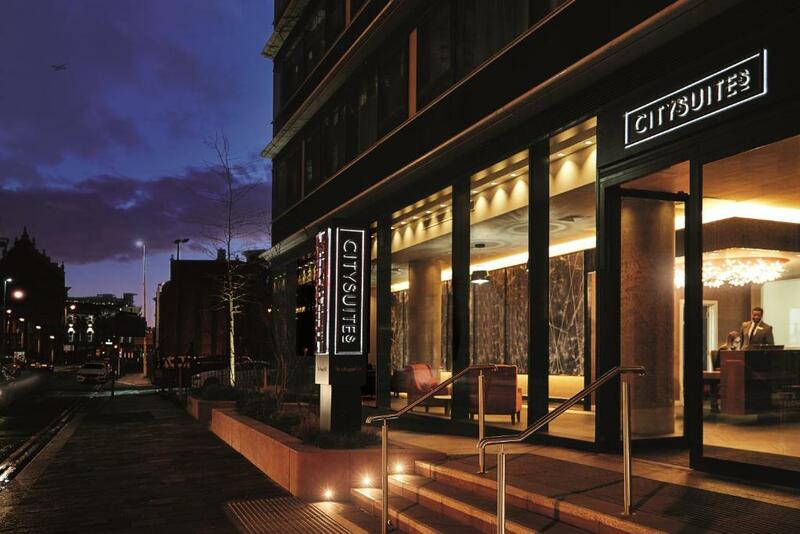 City Suites Manchester has such first-class service that truly rivals some 'luxury hotels'. From the concierge, front desk to house keeping and most of all, their personable Operations Director, Mr Gavin Bailey, every single person is stellar! Nothing is too much trouble for the team! We had lovely breakfast with perfectly cooked eggs...! 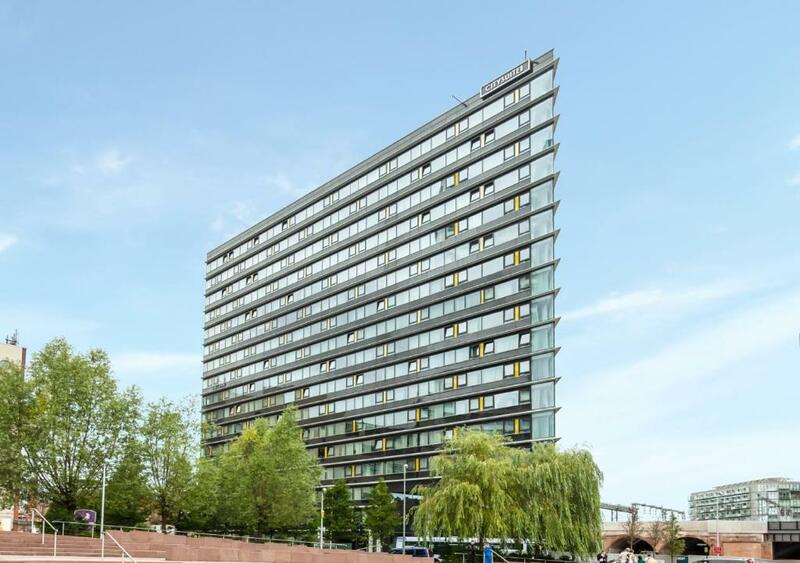 Location is excellent, easy access to trains, trams and has a great next-door car park. Within 5-mins walk to great shopping and lots of pubs/restaurants. All the facilities you need for work and vacation whilst feeling right at home...Overall, a first class experience without the first class price tag! Lock in a great price for CitySuites Aparthotel - rated 9.4 by recent guests. One of our top picks in Manchester – and a guest favourite. Deansgate is a 2-minute walk away and Manchester Victoria Station is 400 yards away. Free WiFi is available throughout the property. The building has swimming pool, gym and hot tub available for guests to use. The accommodation is air conditioned and is fitted with a flat-screen TV with satellite channels. There is a seating and/or dining area in all units. There is also a kitchen, equipped with a dishwasher, oven and microwave. A toaster and coffee machine are also offered. Every unit features a private bathroom with bathrobes and slippers. Towels and bed linen are featured, and all apartments are serviced on a weekly basis. An Executive lounge is available for residents. There is also a buffet-style breakfast and dinner available for an additional cost at CitySuites. Manchester Cathedral is a 3-minute walk from CitySuites, while the Manchester Central Convention Complex is 0.7 miles from the property. The nearest airport is Manchester Airport, 9.8 miles from CitySuites. CitySuites Aparthotel has been welcoming Booking.com guests since 12 Dec 2016. When would you like to stay at CitySuites Aparthotel? This apartment has a fully equipped kitchen, air-conditioning, walk-in rainfall shower, Egyptian cotton-bedding, 4-seater corner sofa and 50-inch Smart TV with satellite channels. Public parking is possible at a location nearby (reservation is needed) and costs GBP 16 per day. This apartment has a city view and features a fully equipped kitchen, air-conditioning, walk-in rainfall shower, Egyptian cotton-bedding, 4-seater corner sofa and 50-inch Smart TV with satellite channels. This apartment has a separate carpeted bedroom with large wardrobe space and 40-inch Smart TV. There is also a kitchen and lounge featuring a fully equipped kitchen, 4-seater corner sofa and 50-inch Smart TV with satellite channels. The apartment also has air-conditioning and a large bathtub with rainfall shower. This apartment has a city view and separate carpeted bedroom with large wardrobe space and 40-inch Smart TV. There is also a kitchen and lounge featuring a fully equipped kitchen, 4-seater corner sofa and 50-inch Smart TV with satellite channels. The apartment also has air-conditioning and a large bathtub with rainfall shower. This apartment has a unique layout and panoramic view with separate carpeted bedroom with large wardrobe space and 40-inch Smart TV. There is also a kitchen and lounge featuring a fully equipped kitchen, comfy sofa and 50-inch Smart TV with satellite channels. The apartment also has air-conditioning and a large bathtub with rainfall shower. This apartment has two carpeted bedrooms, both complete with large wardrobe space, Egyptian cotton bed linen, and 40-inch flat-screen Smart TVs. One bedroom has an en-suite bathroom with walk-in shower. There is a spacious kitchen and dining area featuring a fully equipped kitchen, seating and dining area, and 50-inch Smart TV with satellite channels. 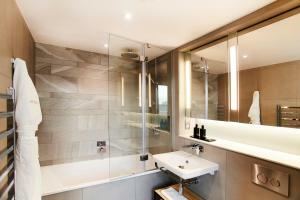 The apartment also has air-conditioning and a separate bathroom with large bathtub with rainfall shower. Family CityScape Apartment sleeps 4. Spacious King sized 1 bedroom apartment with additional pull out sofa bed ideally suited for a family of 4. Ideal for 2 adults and 2 children (under 12). There is also a kitchen and lounge featuring a fully equipped kitchen, 50-inch Smart TV with Sky TV. The apartment also has air-conditioning and a large bathtub with rainfall shower. Gavin guides the CitySuites team to deliver quality and exceptional customer service across all aspects of our guest’s stay. Having spent a career working for luxury brands, such as Porsche and Ferrari, he is passionate about ensuring every one of his customers has the best possible stay and an unforgettable experience at CitySuites. 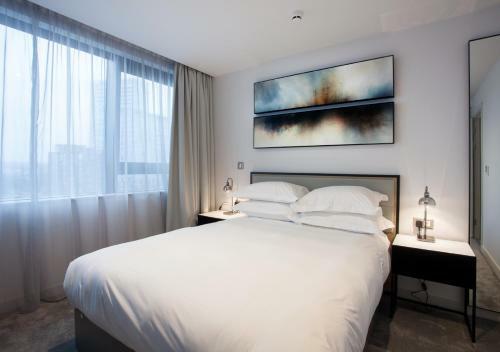 The whole city opens up for you within mere moments Located just off Deansgate next to the city's cathedral, shopping boutiques, restaurants and the major business centres, CitySuites is set in the heart of Manchester. Less than a five-minute walk from Manchester Victoria train station, and only a short walk, train or tram ride from Media City, Piccadilly Station and Manchester Airport. House rules CitySuites Aparthotel takes special requests - add in the next step! Bankcard CitySuites Aparthotel accepts these cards and reserves the right to temporarily hold an amount prior to arrival. CitySuites Aparthotel accepts these cards and reserves the right to temporarily hold an amount prior to arrival. Please note that this property does not accept cash or cheques as a method of payment. Please note, apartments are serviced on a weekly basis. Any items left behind in the apartments and/or public areas will be stored for a maximum of 30 days from the departure date. Items will be given to charity unless claimed within the specified time frame. Please inform CitySuites Aparthotel in advance of your expected arrival time. You can use the Special Requests box when booking, or contact the property directly with the contact details provided in your confirmation. Bed was too firm for my liking. Breakfast was cold and not a lot of choice for the money we paid. Freezer didn't work, we weren't aware so it ruined some food. The breakfast variety was limited, especially the apartments are equipped with a kitchen and could easily prepare breakfast in my room, it wasn’t worth 12£ daily. I also didn’t like the view of the apartment over the back side of the hotel and the noise of the constructions. Apart from that everything was very good and high standards for a European hotel. The air conditioning didnt work, reported it to reception so the lady suggested i waited 10 minutes. I waited 2 hours the air con to come on and it still didnt sork as it was freezing in the room. She suggested to bring a heater, she went to get it only to return to say they didnt have one and if I would like a extra quilt. No thank you I paid a premium price for the room the least she could have offered was to change our rooms instead for 2 days we sat with an apartment with no heating. The mattress on the bed was very uncomfortable and the quality of breakfast was not good at all for the money they charged.